Being implemented by the United Nations, Agenda 21 is a plan of action meant to promote “sustainable development” going back as far as 1987 but was openly conceived in 1992 at the United Nations Conference on Environment and Development (UNCED) held in Rio de Janeiro, Brazil. It was signed into place in 1992 by president George H. W. Bush at the Rio Accords on behalf of the United States. The UN is the vehicle being used to solidify its existence internationally. In 1993 president Bill Clinton signed an executive order to create the President’s Council on Sustainable Development with “sustainable development” as the center feature of federal policy. Bypassing Congress and instilling a silent and progressive move towards collectivism without protest or even acknowledgment by the majority of the citizens. UNCED also known as the UN Earth Summit, was organized by Canadian billionaire Maurice Strong who is a self confessed socialist. Strong is also the Secretary General of UNCED who is now living in Communist China as an advisor to the Chinese government on economic policies and suggests International Trade Agreements. A Club of Rome member, he has also propagated the ‘global warming’ movement with the help of Al Gore. After the “fall” of the Soviet Union, Mikhail Gorbachev who is also a Club of Rome member; was moved with the help of president George H.W. Bush to the military Presidio in San Francisco. Gorbachev was then given money by the Rockefeller and Ford Foundations to create the Gorbachev Foundation which has parented the Green Cross, allegedly one of the most respected environmental organizations on the planet. Mikhail Gorbachev and Maurice Strong joined forces and each co-chaired the Earth Charter Initiative in 1997 for “sustainability” and have been implementing Agenda 21 with their charter as the main focal point since its birth. The terms “sustainable”, “smart-growth”, “high-density” and “biodiversity” are words that have been thrown around quite a bit by the UN and cooperating governments, but these terms are not what they seem. 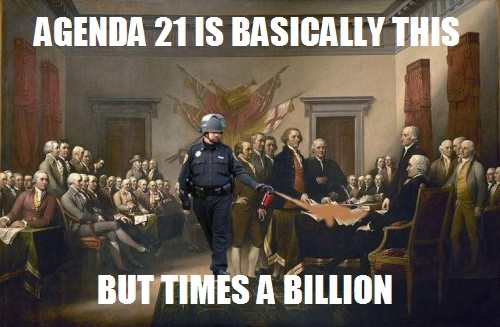 Agenda 21 intends to strip individual priorities and rights into “community” priorities. Priorities for the interest of the community alone, there are no individual rights to conflict with this system once in place. Governments to eliminate all traces of private land ownership and relocation to pre-determined urban areas where private transportation would be illegalized a map of the United States under Agenda 21, a redistribution of wealth, elimination of single family homes, the state as the new head of the family and a restructuring of the family unit, an end to free market in exchange for Public Private Partnerships (PPP) which are nothing more than government sponsored monopolies, an elimination of national sovereignty (apparently it’s a “social injustice”), and the state assigning jobs as well as raising all children. If you want to confirm this you can read it all yourself in their own documents. Agenda 21 is being implemented by assistance groups like the Local Governments for Sustainability (ICLEI) in every town and state in the nation, but understand this is also being executed globally. So far 600 towns in the United States have given in mostly unknowingly; over 178 countries have also signed onto Agenda 21 and it is now being implemented. The UN’s own constitution says one can exercise freedoms and rights as long as they don’t contradict the UN, despite the fact the UN has many socialists and communists in prominent positions of power. 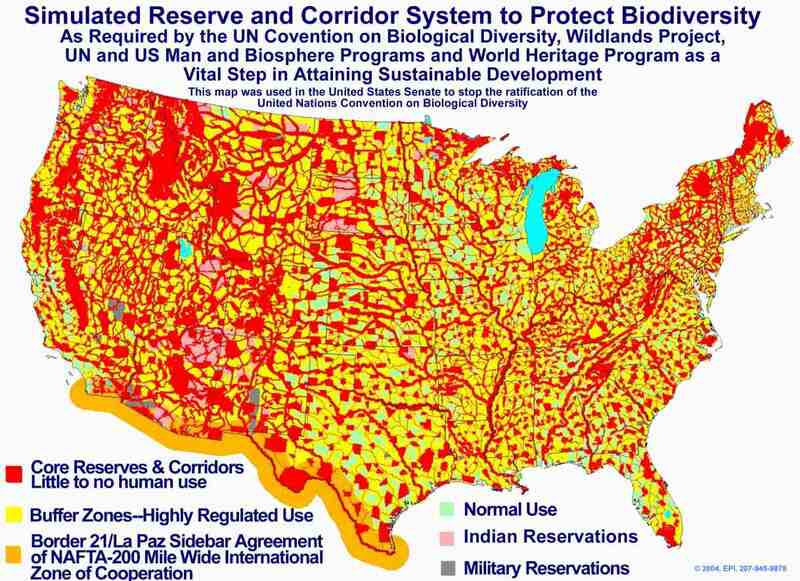 Agenda 21 also is intended to be tied into the America 2050 Project. 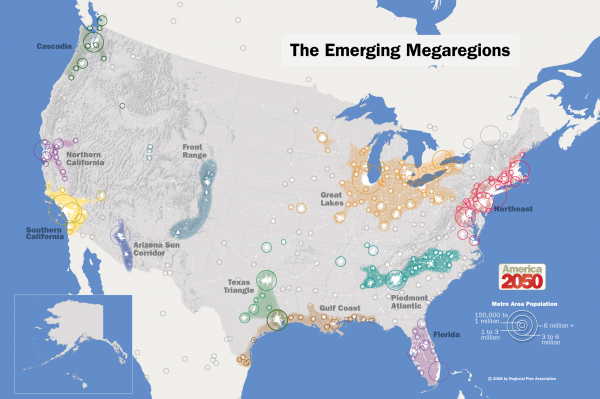 The America 2050 Project is a non-profit organization that intends to have every person in America living in what they call, ‘megaregions’ that will be connected with bullet trains by the year 2050. Above is a picture of the ‘megaregions’ of the America 2050 project. I feel that this is all being coordinated, and the only way to kill this entire plan is through rooting out those who are supporting this in your local councils. The ICLEI website has a list of all its members. This is being implemented by the day at a more rapid pace, and only information, awareness, and activism can stop this trojan horse from being implemented.